WASHINGTON, September 7, 2010 – A new World Bank report says volatility in food prices has been a key factor behind a rising tide of large scale farmland purchases in the developing world, which can pose social and environment risks, if not well managed. 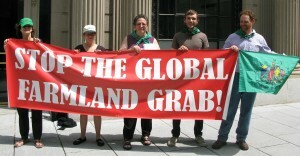 The report, Rising Global Interest in Farmland, calls on developing countries to recognize and respect resource rights of their people, warning that countries with poor records of formally recognized land tenure attract strong investor interest – which raises real concerns about the ability to protect vulnerable people from losing their land. While highlighting benefits behind large scale land purchases, the report also calls for more transparency and monitoring of such purchases, saying in countries where demand for land has recently risen, limited screening of proposals, lack of due diligence and an air of secrecy has created an environment conducive to weak governance. Spurred on by the 2008 food, fuel and financial crisis and continuing food volatility, the report says the number of reported large scale farmland deals amounted to 45 million hectares in 2009 alone. That’s compared with an average expansion rate of 4 million hectares a year in the decade leading up to 2008. It says in many countries, both those with and without land available for expansion, there is large scope to dramatically increase productivity on currently cultivated land, a move that could have major impacts on poverty and food security. “Currently none of the African countries of interest to investors achieves even a quarter of its potential productivity.. Rather than just focus only on an expansion of uncultivated land, it is important that investors and governments support improvements in technology, infrastructure, and institutions that can improve productivity on existing farmland,” says Klaus Deininger, lead economist in the Bank’s Development Research Department and author of the report. The report reveals a mixed picture on how land deals are handled in Africa, Latin America, Europe and Asia. Some countries have worked with smallholder farmers and use competitive bidding to foster investment deals that benefit local people. This generated significant employment, provided access to markets and technology, and helped to improve social services at the local level. But it says far too many other governments have been caught unprepared by the increase in demand and made deals with outside investors without first clearly recognizing existing rights. It says in some cases where people’s rights have been ignored there has been conflict over land, undermining investment incentives. Many people have few options for recourse when they are hurt by specific ventures or investors fail to live up to their promises. The report calls for a country-led approach to outside investment that sets clear criteria and recognizes land rights, so allowing existing owners to negotiate directly with investors for fair compensation. It says when local governments play a stronger role and factor land investments into their overall strategies, rural people will reap the benefits. It also calls for greater public disclosure, broader access to information and vigilant monitoring by civil society organizations. Early findings from the report have already prompted the World Bank Group to work with FAO, IFAD, UNCTAD and other stakeholders to develop seven voluntary principles for responsible agricultural investment. It says for investments to do no harm, be sustainable and contribute to development they should adhere to these principles: : 1) Respect land and resource rights; 2) Ensure food security; 3) Ensure transparency, good governance and a proper enabling environment; 4.) Consultation and participation; 5) Responsible agro-enterprise investing; 6) Social sustainability and 7) environmental sustainability. The Bank is now working with governments and other stakeholders to translate the principles into practice. A multi-stakeholder e-discussion on the farmland report will take place later this month. Hosted by the Global Donor Platform for Rural Development and facilitated by the International Institute for Sustainable Development, it will garner inputs from farmer groups, CSOs, private sector representatives and public policymakers on options for viable policies moving forward. The report, a joint production of the Bank’s research and agriculture and rural departments, predicts the wave of interest will continue. By conservative estimates, in developing countries six million hectares of additional land will be under production each year to 2030. Two-thirds of the expansion over the next 20 years is likely to be in Sub-Saharan Africa and Latin America, where potential farmland is relatively abundant. Multi-stakeholder efforts to monitor and share experience about successful approaches and partnerships between investors and local producers will be of great importance.